Employees are increasingly using bring-your-own devices (BYOD) to work and accessing corporate IT resources from home. Until now, management of BYOD within IT was piecemeal, with most organizations cob­bling together solutions that included mobile device management software, unified access suites, security, and hardware. 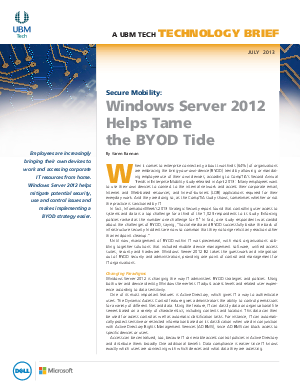 Read this technology brief to learn how Windows Server 2012 R2 takes the guesswork and integration out of BYOD security and administration, providing one point of control and management for IT organizations.